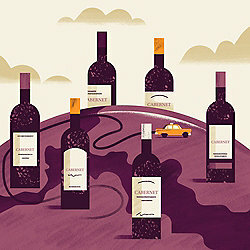 Our sampler of fantastic Cabernets is truly a Cab lover's delight. This 6 bottle (each, 750 ml) sampler includes some of the best values you can find in rich, ripe, top-quality Cabs from around the world. A great way to taste and compare Cabs made from different vineyards and microclimates and see why Cabernet the best-loved wine in the world.